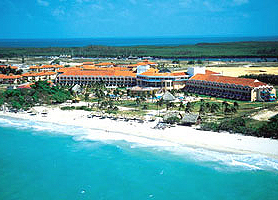 Quite simply every Hotel in Varadero Cuba; All-Inclusive from 3 to 5 star Hotels with guaranteed bookings, NO PREPAYMENT, compare rates on all Varadero Hotels before booking, choose exclusive rooms at each hotel and book immediately or simply review maps of hotels in Varadero Cuba, Our extensive guests reviews of Varadero Hotels, latest prices and discounted hotels in Varadero Cuba. Book with the Varadero professionals, Varadero Hotels – That’s all we know! 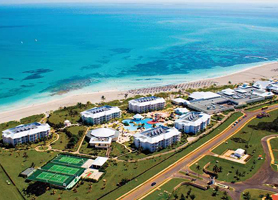 Brisas del Caribe is located on the famed beach of Varadero an is an all inclusive resort. Having attained a Cuban 4 stars and with 444 rooms the resort is by no means small but manages to reduce its size due to the personal and welcoming staff. For a long time a favorite with couples and honeymoon guests, the hotel offers a nice blend of economic pricing and excellent value for money. The dinner buffet is truly out of this world with shrimp, freshly grilled chicken, roast leg of pork, grilled snapper, steaks and a massive array of salads: tomato, avocado, carrot, lettuce, etc. Several types of sweets, ice cream flavors to die for…. In short, Brisas del Caribe Varadero is famous amongst returning guests for its excellent food assortment. The hotel is split into two areas, Brisas del Norte and Brisas del Sur both areas have separate pools, Brisas del Sur being the deepest of the two, the other has a nice swimming pool for children which naturally attracts youngsters to one pool and adults to the other. Each area also has a large Jacuzzi pool. The rooms are simple but clean and well maintained, excellent for a good night’s rest and offering multiple international TV channels, minibar and excellent air-conditioning. Of course, the main reason to visit Brisas del Caribe is the beach and, what a beach! 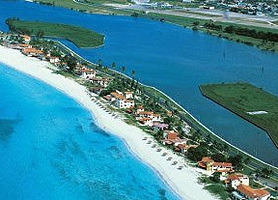 Due to the hotels location on the Varadero peninsula it has one of the nicest beaches of the whole area. The sea is shallow until further out than hotels further down the peninsula making the beach ideal for younger children or the elderly. Close to the main strip in Varadero you can also venture out regularly and take leisurely walks to the local handcraft and artisan fairs, shops and boutiques. Unlike hotels at the further end of Varadero the Brisas del Caribe is ideally located. 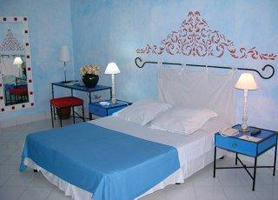 Hotel Brisas del Caribe Varadero is usually in very high demand and, as such, should be booked in advance. Our booking program allows reservations at Hotel Brisas del Caribe without down payment or deposit which will guarantee your dates and also allows preferential modifications should your dates change in the future. Our booking process is unique because it shows the best rate from all of these for Hotel Brisas del Caribe in Varadero Cuba and the types of rooms available. Our Hotel Brisas del Caribe Varadero rate comparison is an industry first for Cuban Hotels. Once you’ve compared the rates, finalizing the booking at Hotel Brisas del Caribe Varadero takes just seconds and an immediate confirmation is provided in real-time. The Blau Marina Varadero is a 5 star All-Inclusive resort On the Hicacos peninsula area of Varadero, on which most of the most luxurious hotels are situated. Surrounded by beautiful natural gardens and breathtaking views of the white sand beach and Caribbean Sea Blau Marina Varadero is truly a spectacular hotel. Unlike many 5 stars, Blau Marina Varadero is geared towards both families and couples, offering a pleasant mix of entertainment to cater for both market segments perfectly. The 548 rooms are pure class, beautifully appointed with VIP type undertones divided into standard Twin rooms, Twins with Sea View and impressive Suites. The Blau Marina Varadero conference with 300 seats is ideal for weddings or corporate events. The onsite Business center offers secretarial services, PCs, Fixed cable internet and Wi-Fi. In fact, Wi-Fi is available throughout most of the resorts common areas. 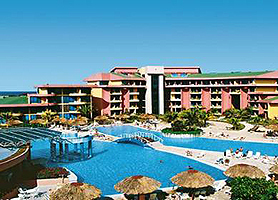 Blau Marina Varadero is one fo the few hotels in Varadero where kids up to 12 are free. For a truly luxurious stay in Varadero you would find it difficult to beat Blau Marina Varadero for overall value and attention to detail. 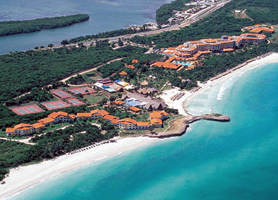 Hotel Blau Marina Varadero is usually in very high demand and, as such, should be booked in advance. Our booking program allows reservations at Hotel Blau Marina without down payment or deposit which will guarantee your dates and also allows preferential modifications should your dates change in the future. Our booking process is unique because it shows the best rate from all of these for Hotel Blau Marina in Varadero Cuba and the types of rooms available. 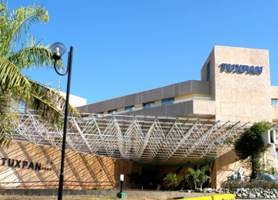 Our Hotel Blau Marina Varadero rate comparison is an industry first for Cuban Hotels. Once you’ve compared the rates, finalizing the booking at Hotel Blau Marina Varadero takes just seconds and an immediate confirmation is provided in real-time. 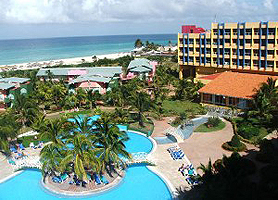 Occidental Allegro Varadero is located in Varadero at the Hicacos Peninsula, the newest area of Varadero to date. Reopened in 2010 after a complete refurbishment the Occidental Allegro Varadero offers a brand new image to guests. 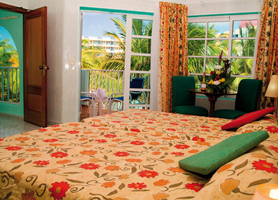 Occidental Allegro Varadero is located on a dazzling private beach surrounded by abundant tropical vegetation. 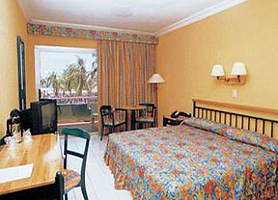 Occidental Allegro Varadero has 534 Rooms distributed as follows: 472 double standard rooms. 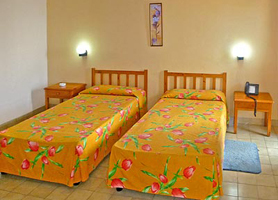 Unlike many hotels in Varadero the maximum occupation of these rooms are 2 adults + 2 children or 3 adults. The 31 Junior Suites are larger and accommodate the same numbers of guests but offer more size and thus comfort. All the rooms offer: Air Conditioning with central control Terrace/Balcony Phone (direct foreign line) Satellite TV, Full bathroom with WC separated, Hairdryer, Radio + Cd Player Coffeemaker, Safety deposit box, Minibar, Iron and ironing board. The Occidental Allegro Varadero ALL-INCLUSIVE FEATURES: All meals and drinks Breakfast, lunch and dinner in the main buffet Infusions, coffee, and mineral water Unlimited juices and sodas Unlimited sodas and juices Wine served at lunch and dinner One dinner per week at each a la carte Restaurant. The A La Carte restaurants are the Italian Mamma Mia, Gourmet Palma Real and Grilled seafood restaurant called Frutos del Mar. The Snack bar Cayo Coco is open from 10.00 – 18.00 plus Occidental Allegro Varadero has an Ice Cream Parlor! On the beach you’ll also be able to get a bite to eat at the Ranchón “El Mirador” Its enormous 4 pools divided into 3 adults swimming pools and one children’s swimming pool provide a concise daily activity program including shows for adults and children Diving lessons in the pool Towel service for pool and beach Sports. For those of your with sport on your minds Occidental Allegro Varadero has 6 Tennis courts, Varadero Golf 18 hole course right next door and an onsite Gym. Non motorized waters sports available: Kayaks, Snorkeling, Sail, Water Aerobics and Windsurf. The resort features numerous stores like; Mini market, Photo shop to develop photos and videos, Cigar Shop, Beauty parlor, Massage Service, Exchange bank. Other services available at Occidental Allegro Varadero are; Babysitting service Laundry service Medical Care available 24 hours Rent a car and bikes Excursions Wide selection of excursions and both fixed and Wi-Fi internet service. 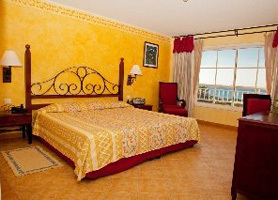 Hotel Occidental Allegro Varadero is usually in very high demand and, as such, should be booked in advance. Our booking program allows reservations at Hotel Occidental Allegro without down payment or deposit which will guarantee your dates and also allows preferential modifications should your dates change in the future. Our booking process is unique because it shows the best rate from all of these for Hotel Occidental Allegro in Varadero Cuba and the types of rooms available. 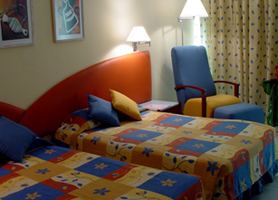 Our Hotel Occidental Allegro Varadero rate comparison is an industry first for Cuban Hotels. Once you’ve compared the rates, finalizing the booking at Hotel Occidental Allegro Varadero takes just seconds and an immediate confirmation is provided in real-time. 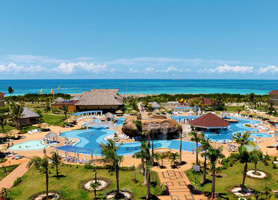 Memories Varadero Beach Resort is a luxurious 4 star superior on Varadero Beach in Cuba. 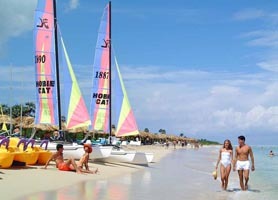 Memories Varadero offers excellent value with its impressive all inclusive services and deluxe amenities. Located on one of the most beautiful beaches called Playa Hicacos, Memories Varadero is an ideal destination for a romantic getaway or an action packed family vacation. Memories Varadero brings to your vacation a fusion of charming colonial architecture and Caribbean flair with pristine pools which reflect the clear blue skies and turquoise Caribbean waters, and harmonize the lush gardens and tropical foliage that border the resort. Memories Varadero has enormous guestrooms and suites which feature deluxe amenities, rich wood furnishings, and warm and tropical colors that harmonize perfectly with the natural Caribbean décor. Memories Varadero has an amazing assortment of restaurants to please all palates. Select from an extensive collection of global cuisines at the 8 à la carte restaurants, including Italian, Japanese, and Mexican, or savor a selection of your favorite comfort foods at the international buffet or 2 snack bars. Try a different restaurant for each night of the week if you like. Memories Varadero is a 4 star all-inclusive which offers guests an experience similar to a 5 star but at the lower 4 star rate. The Memories Varadero is unique in this respect. Hotel Memories Varadero is usually in very high demand and, as such, should be booked in advance. Our booking program allows reservations at Hotel Memories without down payment or deposit which will guarantee your dates and also allows preferential modifications should your dates change in the future. Our booking process is unique because it shows the best rate from all of these for Hotel Memories in Varadero Cuba and the types of rooms available. Our Hotel Memories Varadero rate comparison is an industry first for Cuban Hotels. Once you’ve compared the rates, finalizing the booking at Hotel Memories Varadero takes just seconds and an immediate confirmation is provided in real-time. Hotel Club Karey Varadero is one of Varaderos classic hotels located right in the downtown area of the city, close to Parque Josone and a plethora of Restaurants and Varadero Paladares should you wish to have a meal outside the hotel this is a great location to do this. There is a Varadero Car rental office right at reception also. Situated right on the beach and just a few minutes’ walk from the center, the all-inclusive Club Karey Varadero is a great budget hotel for those who feel that Varadero’s pristine white sand beach is the reason they are visiting Cuba. The hotel consist of small separate Hacienda type Villas situated on the white sands, offering both great privacy and a break from the tower block type structures featured in other areas of Varadero. The food is great and all drinks are included in the bargain basement price the Club Karey Varadero offers. If your idea of a Caribbean vacation is lounging on the beach, snorkeling and having fun, then the Club Karey Varadero will tick all those boxes. 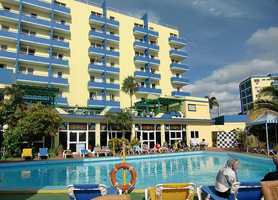 Hotel Club Karey Varadero is usually in very high demand and, as such, should be booked in advance. Our booking program allows reservations at Hotel Club Karey without down payment or deposit which will guarantee your dates and also allows preferential modifications should your dates change in the future. Our booking process is unique because it shows the best rate from all of these for Hotel Club Karey in Varadero Cuba and the types of rooms available. Our Hotel Club Karey Varadero rate comparison is an industry first for Cuban Hotels. Once you’ve compared the rates, finalizing the booking at Hotel Club Karey Varadero takes just seconds and an immediate confirmation is provided in real-time. 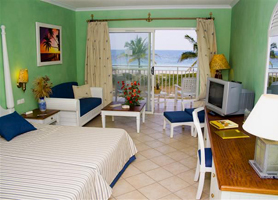 Hotel Acuazul Varadero features 78 spacious rooms incorporating balcony, safe, separate washroom, telephone and satellite TV. As a two star all-inclusive right in the downtown area of Varadero the hotel offers economic accommodation just two minutes from one of the best beaches on the planet. The gastronomy is served at the main hotel buffet, the snack bar or the beach bar. Although cheap the hotel still offers a nice large pool, free sun beds both at the pool and the beach, along with full service reception featuring Wi-Fi and free parking for guests. The hotels Beach front location means that it is within a 5 minute walk from Parque Josone theme park, numerous restaurants and paladares in downtown Varadero and, of course, the amazing nightlife only found in the city center. If you are looking for an economic accommodation in Varadero, Hotel Acuazul ticks all the boxes with its basic but complete offer to guests. Due to its budget price, Hotel Acuazul Varadero is usually in very high demand and, as such, should be booked in advance. 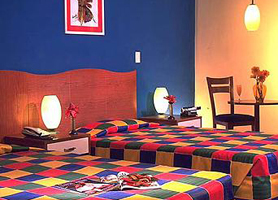 Our booking program allows reservations at Hotel Acuazul without down payment or deposit which will guarantee your dates and also allows preferential modifications should your dates change in the future. 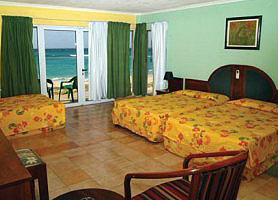 Our booking process is unique because it shows the best rate from all of these for Hotel Acuazul in Varadero Cuba and the types of rooms available. 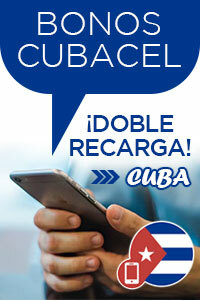 Our Hotel Acuazul Varadero rate comparison is an industry first for Cuban Hotels. Once you’ve compared the rates, finalizing the booking at Hotel Acuazul Varadero takes just seconds and an immediate confirmation is provided in real-time.